Case managers work with clients to determine the best avenues of increasing their income based on employability and health assessments. When clients cannot be matched for employment opportunities, they are referred to benefits assistance programs. Benefits Assistance helps clients obtain government benefits, and if needed, provide money management services to ensure they have the resources to meet their basic needs and continue their progress toward self-sufficiency. Our Bread and Roses Café serves hot, nutritious meals to homeless men and women in a restaurant-style setting that fosters dignity and respect. 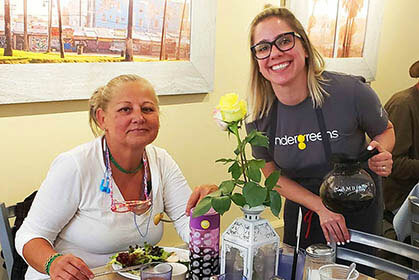 Meals are made fresh daily by a professional chef, and a dedicated case manager is on-site to connect guests to the services they need to get back on their feet. Bread and Roses Café serves more than 500 meals every week. Los Angeles County’s Coordinated Entry System for Individuals (CES) aligns all the adult homeless services available into one seamless, collaborative and County-wide platform. The goal of CES is to reduce the length of time an individual is homeless and permanently house them as quickly as possible. St. Joseph Center is the lead CES service provider for the Westside, including Beverly Hills, Brentwood, Culver City, Malibu, Pacific Palisades, Playa del Rey, Santa Monica, and Venice. St. Joseph Center’s Food Pantry provides low-income households with supplemental groceries and educational workshops designed to lighten their economic load and promote healthy living. We use a “choice model” that lets our clients select their own food in a friendly, market style setting. This empowers people to select items they enjoy and will use. Our partners include the Westside Food Bank, Food Forward, and local grocers who generously donate much of the food we distribute. St. Joseph Center’s Homeless Service Center (HSC) serves as a point of entry into the Westside’s Coordinated Entry System (CES). We offer intakes, assessments, case management services, housing and mental health referrals, showers, toilet facilities, transportation support, mail services, and reservations to our Bread & Roses Cafe. HSC is one of the few access centers that still accepts new clients on a walk-in basis Monday through Friday. Re-Entry services provide support for marginalized and hard-to-reach populations that face a range of barriers upon release from the justice system. After receiving referrals from the Probation Department and other systems, we help clients through their transition by offering resources and case management services with the goal of promoting seamless community reintegration and self-sufficiency. 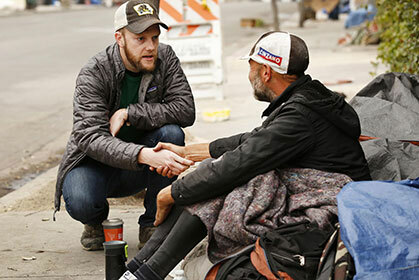 St. Joseph Center’s vehicular and street outreach teams consist of mental health specialists, case managers, RN’s, substance abuse counselors, and peer specialists with lived-experience. These teams are critical to engaging clients and getting them off the streets. 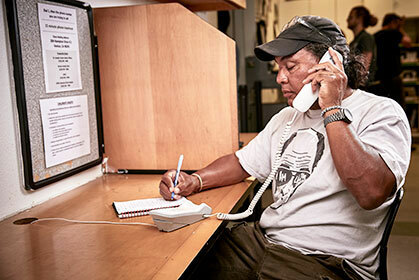 Our outreach teams work throughout Culver City, Santa Monica, Venice, Malibu, and Los Angeles County, helping homeless men and women to connect with services and benefits that will help them regain their health and find permanent housing.